The 16th edition of Rotterdam’s Baroeg Dutch Doom Days took place on 28 and 29 October. As we are used to from the organization, the line-up was again more than great. The Russian band Mare Infinitum was also present and put down one of the better shows. A band that is not yet that known but makes great Doom and deserves to be brought to the attention. Hence an acquaintance with Georgy Bykov, founder of the band and vocalist Ivan Guskov. First of all I would like to congratulate you on your show at Dutch Doom Days in Baroeg Rotterdam last 28th of October, it was awesome! How did you experience this gig and your stay in the Netherlands? Georgy Bykov aka Homer (G.B. ): Thank you very much! It was a great concert for us: amazing audience, really cool bands and great atmosphere of friendship. I would like to thank both Leon van Rijnsbergen and Pim Blankenstein, the guys who made it happened! After the gig I personally spent 2 days in the Netherlands along with my wife (we had sightseeing in Rotterdam and Amsterdam) and then spent 2 days in Dusseldorf. Ivan Guskov (I.G. ): I would like to thank everybody who made our performance at Dutch Doom Days possible. It was an unforgettable experience! I’ve met many friendly people, extremely talented. I saw every band who were playing at the first day, and I want to say that it was a pleasure and honor to share the stage with all of them. I feel like I found a lost part of my family. I hope one day we’ll meet again and play more shows together! This was not my first time in the Netherlands, but it was the first time when I had time just to walk, look around and feel the atmosphere of your beautiful country. I really love it! Of course I would also like to know some more about the band. When / how did it start? What about your line-up? G.B. : I started the band in 2007 with a friend of mine Mikhail (he has his own project called «Frozen Ocean»). We decided to do some songs in genre Funeral Doom Metal. After Mikhail left the project I continued with it on my own. In 2010 I met vocalist Andrei Karpukhin and we recorded 2 full length albums «Sea of Infinity» (2011) and «Alien Monolith God» (2015) together. Ivan joined us during the sessions of the 1st album and became a permanent member. 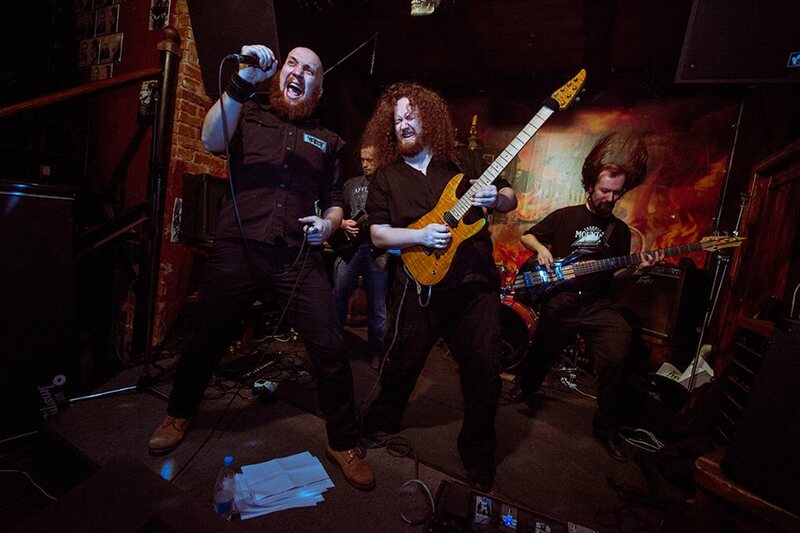 Andrei left the band this year so at this moment our current lineup is: Ivan Guskov – vocals, Georgy Bykov – guitar, Boris Levinskii – bass, Alexey Slavin – drums, Alexander Strelnikov – lead guitar (session). If I got it right, Ivan came to the band to sing the clean part of the vocals but is now also doing the growl parts. Quite amazing! So Ivan did you have experience in doing that kind of vocals or did you just get at doing it when it came up? It seems difficult to combine, how do you manage? I.G. : I had experience in this style of vocals, but when I did it the first time, I had only a few hours to understand how to do it. But I have the best growl teacher in the world – Andrei Karpukhin, the voice of Comatose Vigil, Abstact Spirit and former Mare Infinitum singer. I really think that he’s one of the best growlers in the world because he doesn’t use any technical devices to make it sound deeper or more agressive. And I also never use any technical stuff too. So I understood that it’s just another way of singing and after a little practice I feel that this part of my vocals sounds better. For me it’s not too hard to combine clean and extreme vocals. It’s just a question of practice. Did you always intend to play ‘Epic’ Death Doom or did you just roll into it? G.B. : We were supposed to be a Funeral Doom band but I think the creative process took us into a different dimension. Thus the style of music we play now is something very natural. I.G. 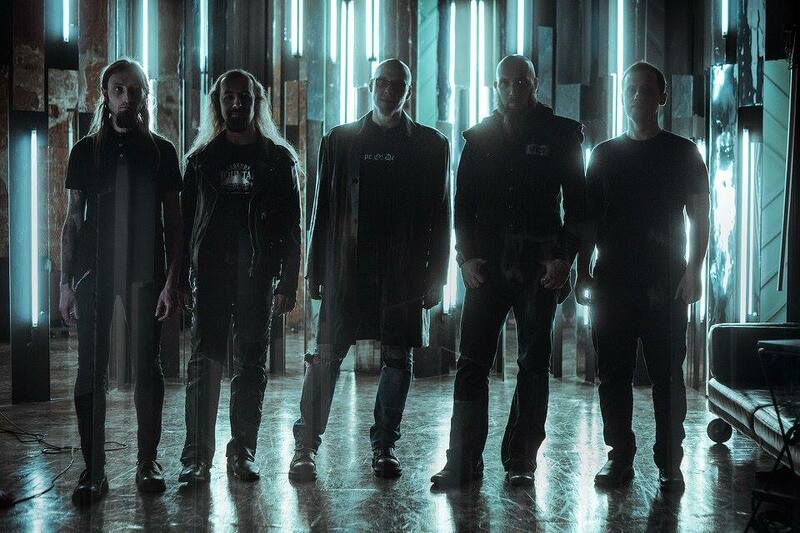 : If somebody asks me about our music style I’m saying that Mare Infinitum plays “Doom-Death metal with progressive influences”. G.B. : I play in the band L’Homme Absurde as a guitar player. It is a project of our drummer Alexey. He writes all the stuff there and performes as vocalist. We play Post Black metal with some progressive elements (like unusual time signatures 17/8 and so on.) But the main priority for me is Mare Infinitum of course. Also I have a few cover bands here in Moscow. We’re playing blues-rock and classic rock. And, of course, my job in the theatre, where I’m performing stuff like hippie tribal-love-rock musical “Hair” or famous “Jesus Christ Superstar”. I like singing, I like to play guitar and harp, I like my job. For me priorities are arranged according to the situation. What bands or artiests would you say influenced your music or way of writting? If I ask you to make a top 5 of your favorite bands or albums, what would you choose? 5. Queen – all albums 1984-1995. 2. Deep Purple – all recordings 68-75 except “Stormbringer”. I don’t know why, but I don’t like this album. How do you think about the more classic Heavy Metal bands from your country like Aria and Kruiz? G.B. : Respect them both! Recently I watched Kruiz concert from 1988 in Munich that was amazing energy! Unfortunatly they didn’t reach the popularity they are worthy of because of the collapse of the USSR. As about Aria they are still one of the most popular metal bands inside Russia. They have several generations of fans and still they earn new listeners. I’m not one of their fans but I like many of their songs and I like their latest album. I.G. : At this point I disagree with Georgy. For me Aria is just a russian local version of Iron Maiden, but more stupid. Kruiz was nice at the end of 80’s, but I prefer more brutal stuff like Shah (album “Beware” still sounds great!) or early tapes of Korrozia Metalla or Black Obelisk. 80’s and early 90’s was a real good time for russian underground metal stage. Can you tell me some more about the Metal scene in Russia? What genre do you think is most popular? From what I have heard, Russian fans can be very enthousiastic. Dutch Death band Bleeding Gods have been on tour in Russia and they really enjoyed themselves! G.B. : I think when you play in Russia and you are a foreign band it is not a question of style. People here like not the genres of music but the bands. So if you have your own audience in Russia they will come to see you no matter what you play. As about Russian metal bands I think the most popular style here is pagan. As far as I know bands like Arkona and Svarga are very popular and are able to play solo gigs in front of hundreds of fans. I.G. : I’m not so involved into the russian metal scene, but I really love some bands from ex-USSR. Band Ennui from Georgia and Stoned Jesus from Ukraine is really great. Thrash band Manic Depression from Moscow and L’Homme Absurde, of course. A week after Dutch Doom Days I visited a local Doom fest. Bands Nebulae Come Sweet, Woe Unto Me and Psilocybe Larvae burned down the house! Mare Infinitum has brought out 2 albums so far, both magnificent by the way. Are you cuurently working on something or is there already some new material ready for a new album? G.B. : Yes, of course. We work on new songs. At the moment we have 5 songs more or less completed and several ideas which will become songs soon. I hope we will start recording next year. How about touring, in your home country and abroad, do you get enough opportunities? What countries have you been to and which ones would you like to do (more), special events? G.B. : Our performance on Dutch Doom Days was the first time we played outside Russia ever. Usually we play concerts in Moscow and a few times we visited other cities in Russia. I hope we will play somwhere in Europe again in a near future. As about touring I think the most reasonable case for us is touring with a big headliner as support band. It doesn’t matter where it would happen. I.G. Dutch. Doom. Days… Our. First. European. Show. Ever. Wow. I don’t know what will happen next, but it’s definitely a good start to keep moving. It’s still a little bit unbelievable for me. Some other plans for the future, the Dutch fans should know of? G.B. : We work on new songs and I hope we will make a new record next year and then we will play it live. Hope to see Dutch fans again! I don’t know if you have search for reviews of ‘Alien Monolith God’ on the internet but I did and every one I found was glorifying! Great of course, did you notice any more attention for the band? G.B. : Yes we read a lot of ‘Alien Monolith God’ reviews and most of them were very positive. Also the album became number 6 of 15 between albums which were nominated to the «Album of the year» on MetalSucks! That is great! Last but not least where can we buy your music? I suppose bandcamp or something like that? Any vinyl release too? G.B. : You can contact us by e-mail Ghost-of-doom@yandex.ru to order CD’s and T-shirts. Or you can contact our record label Solitude Productions (https://solitude-prod.com/) and visit our ban camp. We don’t have any plans to make vinyl edition of our albums but it might happen in the future. Any concluding words from your side? G.B. : Thank you for your support and feedback. Hope to see you all at live shows! I.G. : Thank you for coming and your fantastic support! It was great to meet so many friendly people who REALLY love this music! I also hope that we will see Mare Infinitum perform more often and with me more Doom lovers if I may believe the turnout at Dutch Doom Days during their show. If you have not been there and you love heavy Death Doom with a progressive touch, visit their bandcamp, you will enjoy! Will Bill Ward rejoin Black Sabbath in the final year 2016?